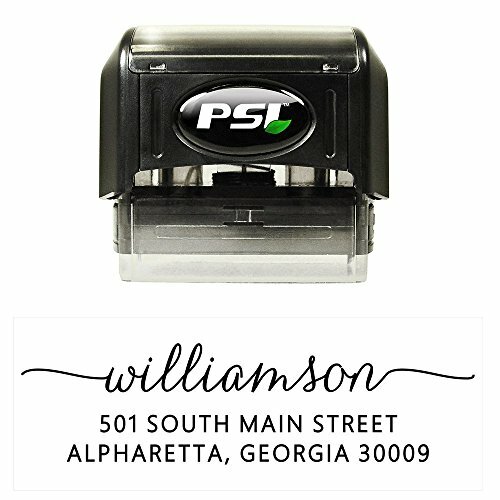 Self inking stamp personalized with your name and address. Makes a great gift for friends, family, teachers, real estate clients…or yourself! Comes pre-filled with black, oil based ink. Max impression size: 2.5″x1″ (impression and font size may vary depending on your text)Perfect for stamping envelopes for wedding invitations, save the dates, RSVP cards, and professional business mail. Personalized with your text. Max impression size: 2.5″x 1″ – size may vary depending on amount of text. Features the name in a beautiful lowercase calligraphy font and the address in an all caps, easy to read sans serif font. Black ink is already integrated in the text plate. Thus no separate ink cartridge is necessary. If you have any confusions about this Return Gift, you can leave a comment below, we try to solve the user questions as soon as possible.